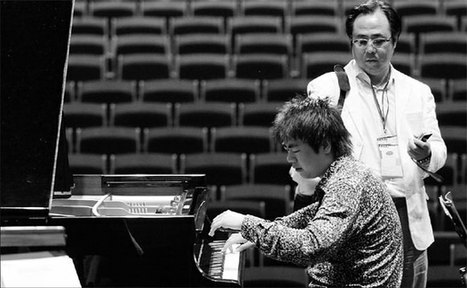 Lang Lang and his father Lang Guoren at a concert rehearsal. Nine-year-old Lang Lang returned home two hours later than usual because he was asked to join the school choir. His father had thought his boy had been playing and was fuming with rage. What happened next may explain the drive behind one of the best pianists the world would ever have. On this particular Beijing day, Lang Guoren was feeling the pressure. He was living off his wife's small income and the neighbors didn't understand why the father and son had moved from their home in Northeast China all this way to Beijing. It was 1992. "What future was there in playing a piano?" They may have asked. To make matters worse, Lang Lang's tutor had said he would not teach him any longer. When the boy finally came home, the angry father beat the boy black and blue without asking anything. He then gave him a bottle of tablets and screamed: "You don't practice hard, why not kill yourself? Take the pills or jump off the building, you can choose. "Then I'll die with you." In complete shock, the boy opened the bottle, but threw it to the floor. He then told his father what he did that afternoon: playing piano for the choir.